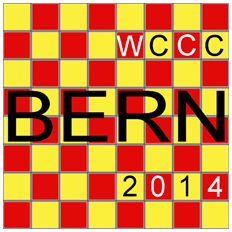 57th WCCC: Bon voyage & good luck! The 57th World Congress of Chess Composition starts today! I wish a nice trip and an excellent time in Bern to all participants! And good luck to everybody in composing tournaments! These days I also need to finish some of my problems for fairy tournaments, so I’d like to ask you to allow me some delay in publication of any materials on JF. The same time I’m inviting you to write here about any news from the Congress, and to post (or to send me for publication) any photos as well! – Julia. 13 Responses to 57th WCCC: Bon voyage & good luck! No comments… Well, I believe that most of you are busy with composing.. me too :). Also, this time I get the results of solving competitions very promptly for publication at http://www.wfcc.ch/. Oh yes, we are composing frantically here in Berne … except for those who are solving in the Championship or sightseeing in the Swiss mountains. We had some interesting lectures yesterday – among them one by Marjan Kovacevic about another style of helpmate composing, in his case h# where the same effect (line-opening etc) is used both positively and negatively – you will have to read his upcoming article in Orbit to understand. Another lecture was by Hans Peter Rehm on evaluation criteria for moremovers with pendulum manoeuvres (what makes one such problem better than another?). And Torsten talked about computer-generated chess problems (the real challenge is to find the good problems among the millions or billions of correct positions). And the one who “finds the good problem” considers him/herself as the author. Even more, the community accepts it. That’s reveals our queer criteria of originality. Any archeologist should be considered as the author of any artifact he digs out and recognizes as worth of his name. The authors of the worthless objects could be the unknown ancient makers. I dont think there are millions of correct problems of 15 moves with 10 pieces. I think there must be millions of millions of such problems. Torsten Linss says there are more than a 1000 million correct selfmate miniatures (with some natural definition of “correct”), and of course the number of correct selfmates with 10 pieces is many many times larger. So does the requirement for the solution to be at least 15 moves long reduce the number significantly? I would not think so. With the longest correct s# miniature being over 150 moves (if I remember Torsten correctly from the lecture), I believe the number of moves where the number of correct problems gets much lower must be much greater than 15. Thanks, Kjell! “we are composing frantically here in Berne … ” – so do I these days, even at my work! 🙂 And I’m not sure if I was composing that much in case of being there.. maybe not, but seeing Swiss mountains! Have a wonderful time there!! Thanks – we are having a wonderful time indeed! Hope to see you next year, in Ostróda or Burgas (we’ll know on Friday). Now we know: see you 2015 in Ostróda, Poland! One main reason may have been that Poland have now invited us three years in a row, so one could say it is their turn to have the invitation accepted. And the Masurian lake district, where Ostróda is situated, is said to be very beautiful. The organizers have plans to arrange buses for us from Gdansk and Warsaw, if I understood correctly. So it should be possible to get there! I might add that I personally found the offer from Bulgaria very attractive (one week at the sea in a very fine hotel! ), and so do those I have spoken to – so if Bulgaria manages to repeat the offer some time in the near future, I think they have great chances of being accepted.